If you’re hearing AWB’s ‘Pick Up The Pieces’ for the first time, then anyone who has already had the pleasure may feel that distinct spark of jealousy rising out of the sheer exhilaration, you are about to experience, with one of the finest slices of funk committed to vinyl. Or perhaps your ears are yet to engage with Teddy Pendergrass’ You Can’t Hide from Yourself, in which case you can absorb the soaring roller-coaster of emotion from one of Souls’ greatest voices for the very first time on twelve inch. 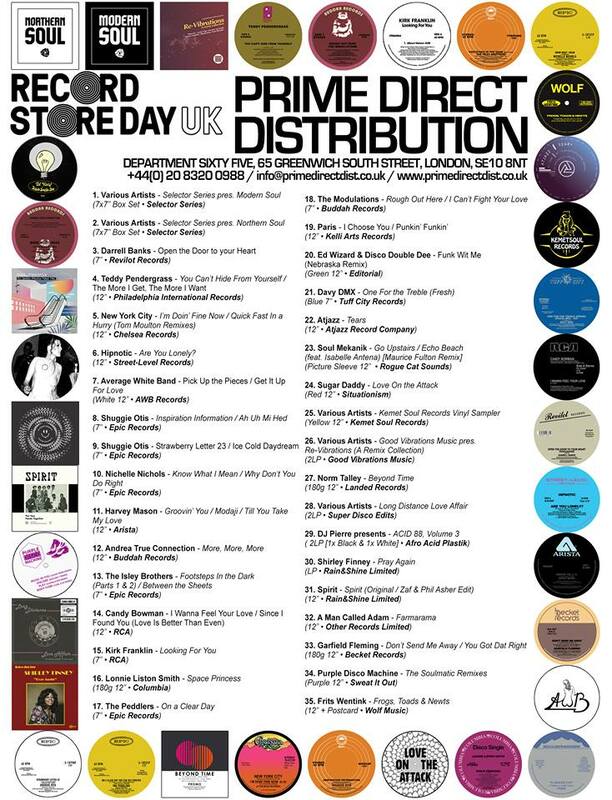 Record Store Day happens this year on April 13 and as such Prime Direct Distribution are about to unleash this beautiful collection of tastefully crafted 45’s alongside a generous number of 12” singles in celebration. However, this being about the significance of music itself and how it sounds uniquely on vinyl you can also dig a little deeper to find sounds hidden by time. Try The Peddlers, ‘On A Clear Day You Can See Forever’ for a spine-tingling rush of harmony from the late sixties, or Lonnie Liston Smith’s headlong dive into Disco with ‘Space Princess’, or the much sought after Darrell Banks ‘Open The Door To Your Heart’. Thankfully music is not solely about the past these days, consequently the schedule includes more contemporary sounds from a glorious array of artists such as DJ Pierre, A Man Called Adam and many more. Of course this set of releases is only one part of a fevered, whole lot of love which happens across the country on April 13. Get out there and explore for yourself.